Have you joined the SavingsPinay Mailing List? I hope you did join because I opened a program for 2016 wherein I will send an article once a month of a particular financial topic straight to you inbox. Aside from that you’ll get more benefits with this program which is absolutely available for free. Click HERE to learn more information. On Day 2 we will focus on the WHY and the HOW. I hope that you find this month’s series helpful. 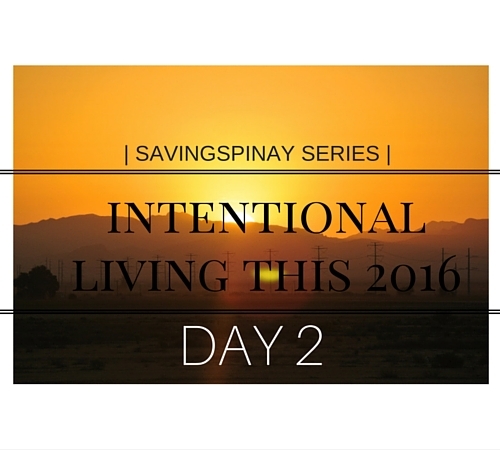 If you are ready to live intentionally this 2016 then read and ponder upon the posts that will be published this week on SavingsPinay. I know many of us still can’t believe that 2016 had already passed us by. It seems like yesterday when 2015 started and now we are on our way to celebrate the New Year. If you answer YES to any or most of what mentioned above then you should be more motivated to live intentionally. Living an intentional life will let you see what’s more important in life. You’ll have a better understanding of yourself. You’ll find a deeper sense of joy and fulfillment in the things you do. Intentional living transforms you current life into a healthier, more fulfilling and abundant one. How to Live Life Intentionally? We can’t handle everything at once. Thus, we need to set priorities. What are the first three to five things that’s most important for you to get done. What are the areas in your life that really want to focus, the you really want to improve? Is it your financial?mental?professional? etc. Learn to prioritize. I know the above is a little confusing but what I’m trying to say is that you need to finally ask the why in everything that you do. There should be a purpose in what you do and it should be aligned with your goals. You don’t just read a book… your read it to learn. You don’t just cook a meal… you cook it to be able to live. You set an intention (a purpose) to everything that you think, you do and you say. I for example would want to live an intentional life this 2016 by one solid intention. That in everything that I do, I say and I think…I will be giving it all for the glory of God. With that on my mind I know that I am setting a solid foundation in life. This 2016, let’s learn together to buy less and do more. Let’s invest in things that we can treasure for a lifetime. Let’s dedicate the year for intentional spending. Travel, learn a new skill or spend quality time with your loved ones. Buy less and do more instead. Have you tried writing a bucket list? If not then try it. This 2016 I’ll be sharing mine in this blog and as the days/months progress let’s cross out one bucket list at a time. Whether it’s physical clutter or emotional clutter, get rid of it. Forgive those who have offended you. Go through your closet or work space and throw the things that you don’t need at all. Try to live in a simpler and more minimalistic approach. Declutter the habits that made you unsuccessful. Declutter the people that make you sad or feel worthless. If you are truly encouraged to live an intentional life this 2016 then you need to be one with God. Find peace in His presence and understand that everything is according to His plan. Let’s live an intentional life this 2016. Tomorrow I’ll be sharing Ways to Live an Intentional Life. I’ll tour you on the process that I’ll be adopting and the tools that I will be using. I hope that you learned something with today’s post.